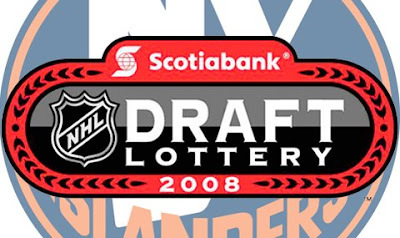 Islanders website: Issued a release after the lottery with comments from Garth Snow. Let the debate begin on who the Isles will select with the fifth pick. Stamkos did not seem to be doing cartwheels. Josef Vasicek and Trent Hunter and Rick DiPietro did ITV interviews on the season. Vasicek said he wants to return next season when interviewed by Chris King. Isles had over forty games with two goals or less. Expect more interviews to be added. Canadian Press: Had a full article today with comments from Bill Guerin, Richard Park, Ted Nolan and Miroslav Satan on the injuries, slumps and disappointment. Miroslav Satan said he hopes not when asked if Friday was his final Islander game as he talked about his numbers not being up to his standards and that next year is a better season.